A trip to Orissa state has been in the waiting for a long time now. And finally it happened over the last week. The week long tour of the state with the family is a memorable experience. We started from Bangalore on a Friday morning by flight to Bhubaneshwar the state capital. On our landing at the new place, hot weather welcomed us. But when we stepped out of restaurant after lunch we were greeted by rain. So the entire trip we had a climate which was hot at times and rainy or cloudy otherwise. On day one, we visited Udaygiri and Khandgiri Jain heritage and then moved to Puri. At Puri on day two, we visited famous Jaganath Temple among other places. The visit to the beach was enjoyed by the kids most. The we proceeded to biggest lake in India, Chilka Lake. We spent more than 3 hours in the lake which is known for migratory birds. On day three we visited World famous Konark Temple. The Ancient World Heritage Site is beauty. Every corner of the temple speaks volumes. From Konark we moved to little known places such as Buddhist Site Kurma and ancient temple at Chaurasi. On day four, we left Puri to Bhubaneshwar via Buddhist site Dahuli. At Bhuwaneshwar we visited world famous Lingaraj Temple and many other ancient temples. The old area of the city has many of these temples. On day five, we left this city to Kendrapara our next destination which is close to Bhuddist triangle Udaygiri, Ratangiri and Lalitgiri. It was pretty late in the day, but we still managed to see all the places here. On day six, we visited wildlife sanctuary Bhitarkanika. The place is famous for salt water crocodiles and migratory birds. We were lucky to spot at least few of them even in the off season. From this place we traveled back to Cuttack. On day seven, we did the local site seeing at Cuttack covering temples, museum, fort. Then on our way back to Bhubaneshwar we visited the Nadankanan zoo. On day eight, we were on train back to Bangalore. 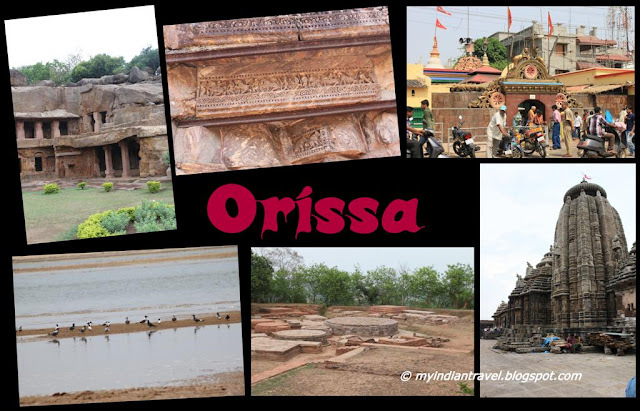 Thus the short trip of Orissa with family was memorable for all as it had something for everyone like heritage monuments, museum, temples, wildlife, lake, beaches, birds. We shall soon explore these places in more detail. Looks like the whole family enjoyed the adventure! Very interesting post, Rajesh. I'd like to see in person these amazing Temples and nice places. Nice post and lovely photographs. Wow! I got worn out just reading about this week-long trip! But what a great time you must have had and such a variety of things to see and do! Love your photos - they give us a good overall view of your excursion! Beautiful photos. The kids look like they're having fun. I love the smiles on their faces. Have a fabulous week. The temples are so interesting to see. Your boys are growing up so handsomely and look very happy! What a wonderful trip and tour to Orissa that you have taken us on, Rajesh! Such a beautiful place! Good to see the young ones have such fun on the beach! Marvelous captures as always! Hope you have a great week! What a great tour!! Boom & Gary of the Vermilon River, Canada. Fantastic shots of your family trip. Fantastic as always. Those funny kids are stealing the show! I especially love the shot of the boys! There certainly is something for everyone here. Looks like a fun trip was had by all, especially the children frolicking on the beach. Nice to see all these contrasting places in your world! Very nice travel photographs! Many thanks for sharing. That sounds awesome, I can't wait to see more! That sure will be a memorable holiday. Looking forward to more pictures. What a great place! And the kids are adorable. Yes, Odisha is beautiful. Glad you had a wonderful holiday! Very interesting place. I love the architecture. Good photos. Me too I love to visit Orissa. Beautiful photos. I especially love the photo of two boys wearing yellow. Are they yours? Love the boys! fantastic trip - I enjoyed every minute. I really enjoyed this visit to Orissa and hope one day to see it for myself. The temples are magnificent! My favourite photo was of your two happy boys. a regular tour guide you are! The kids look so happy in the picture! Very nice place! Good Reference to plan a trip! Will call you ! Very nice place to visit. Great shots. Wonderful photos. The kids are so happy and having so much fun! Very interesting and beautiful photos ! The architecture of the temple is amazing, have never seen such ! The kids looked like they were having a wonderful time. Not only did you get to see such wonderfully historical places but migratory birds as well. I was thinking exactly the same thing as what you said in your last paragraph -- a perfect family vacation -- something for everybody! The younger ones will remember and appreciate the rest of the trip (besides the beach and zoo) when they get older! What a lot you have fitted in seven days. It sound a marvellous, and looks, marvellous. Have you visited the sites of archeology really important!!!! very good pictures , I been to those places when i use to visit bhubhneshwar a couple of years back.. Thank you all. We will soon explore this places more. Wonderful photos of what looks like a fantastic place to visit. A little bit of everything - wow, this tour was fascinating. I remember going to Odissa with my parents. It was such a nice and fulfilling trip. Thanks for taking me there again !! Thank you all. We will explore theses places more.